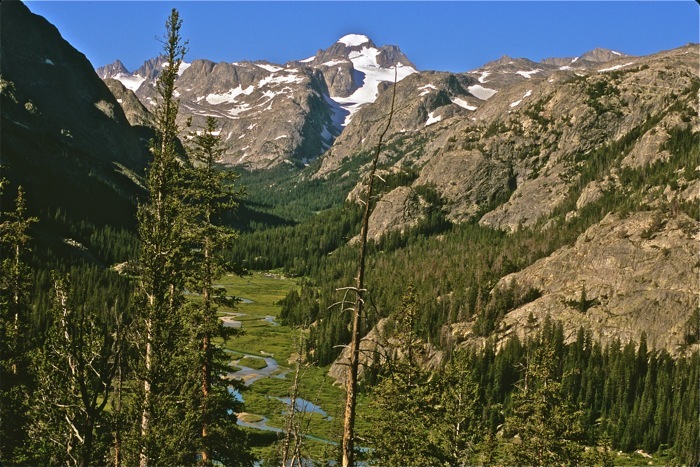 The northern half of the Winds’ east slope is the rugged Fitzpatrick Wilderness in the Shoshone National Forest. 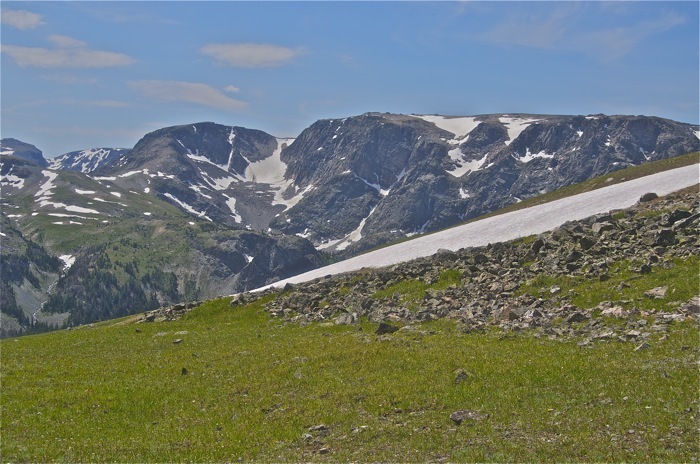 Here, vast glaciers and snow fields flank Wyoming’s highest mountains, including 13,804-foot Gannet Peak on the Continental Divide. We’ll explore remote basins and crystal clear alpine lakes, glacial fed streams, alpine tundra expanses, plus high forests and rich meadows in this expansive mountain wilderness. The rugged high alpine terrain is unsurpassed and the views are big and unrelenting! We will explore a spectacular and seldom-visited chunk of this spectacular wilderness. There are good fishing opportunities,too. Bighorn sheep and many other wildlife species are often seen. This Wyoming backpacking trip is strenuous at high elevations, with a number of big ups and downs, and its base is Jackson, Wyoming. Our Wyoming backpacking routes are all trail heads that access the northeast portion of the Winds. All are fairly close to Dubois, Wyoming. You will experience big glaciers in the highest area of the Rockies north of Colorado! TREK BASE: Jackson, Wyoming. Antler Motel, 43 West Pearl, (800) 522-2406 or (307) 733-2535. MEETING TIME: Pre-trip orientation plus food and gear handout and safety talk at 6 PM the evening prior to the first day of the trip, at the Antler Motel. TREK RATING: This trek is strenuous, so be in top physical condition! There’s plenty of elevation gain and loss with a mix of trail and off-trail hiking. And we cover plenty of miles, too, up to 10 or more on one or two days! ELEVATIONS: 9,000 TO 12,000’. Maximum one-day elevation gain with backpack is 2,500’-3,000’. Due to the high elevations, we recommend that if possible, get to Jackson a day or so early to begin acclimation. WEATHER: Sunny mornings and clear chilly nights are typical. Afternoon thunderstorms can be intense but are usually short-lived. However, at these altitudes we must be prepared for anything from cold rain and even snow to 80-degree heat. Click here for a National Weather Service forecast. SPECIAL FEATURES: This is one of the most spectacular alpine realms in North America, with the highest peaks in the Rockies north of Colorado. 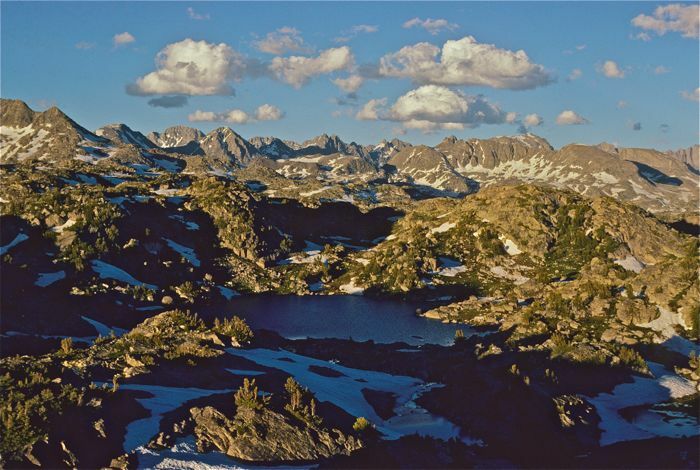 Plus, there are hundreds of sparkling lakes and big glaciers on the granite peaks that tower above forest, wildflower meadows, alpine tundra and bighorn sheep. We’ll be in the Fitzpatrick Wilderness, which constitutes the northern portion of the Winds’ east slope. The spectacular glaciated alpine terrain here is second to none! SPECIAL TIPS: There are bears, so eschew deodorants and other good smelling substances. Good sun protection is important. Go light: eliminate unnecessary items that will weigh you down in the thin air and rugged terrain! CONSERVATION: Most of the Winds are protected Wilderness plus there’s a designated “Roadless Area” on the Indian Reservation portion. However, localized overuse (we avoid these areas), acid rain, climate change, and energy development in the high desert southwest of the Winds provide challenges to maintaining these mountains in their current near-pristine condition. ITINERARY: Our route in this expansive high mountain wilderness will vary from year to year, but it’s 2 or so hours from Jackson Hole to the trailheads, and expect a mid-trip layover for day-hiking or fishing or simple rest and relaxation in a magnificent mountain setting. Please Note: Due to variable routes and conditions, elevations and mileages are approximate. 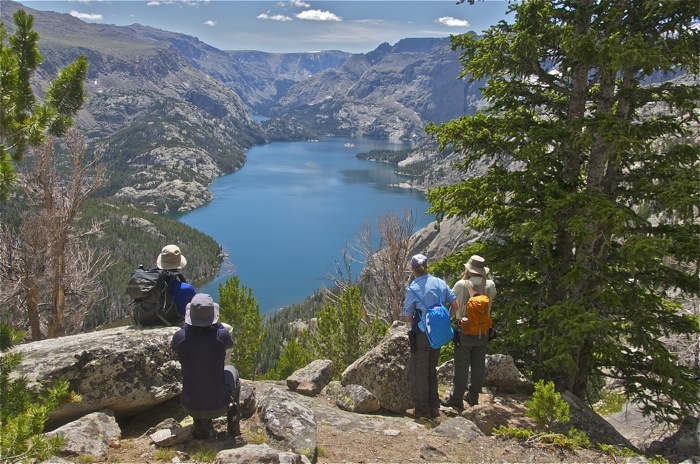 Return to the main Wyoming backpacking trips page to view other related guided tours.